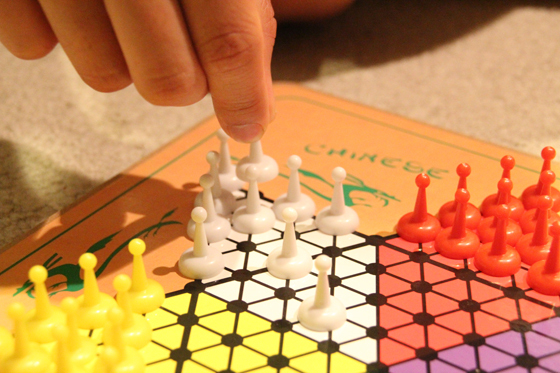 “Chinese Checkers” was not created in China, and really has nothing to do with Asia at all, except that when the Pressman company decided to push marketing for its version of an older American game Halma, the year was 1928 and all things “oriental” were the rage. 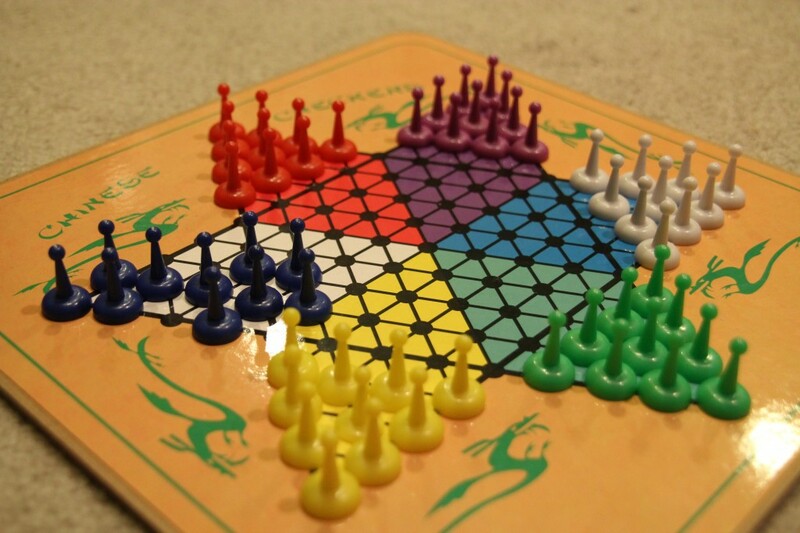 This version was different from the original game Halma only in the shape of the board, which was a six-pointed star instead of a square one, allowing more people to play. We started out on opposite sides of the star, with 15 pieces each. 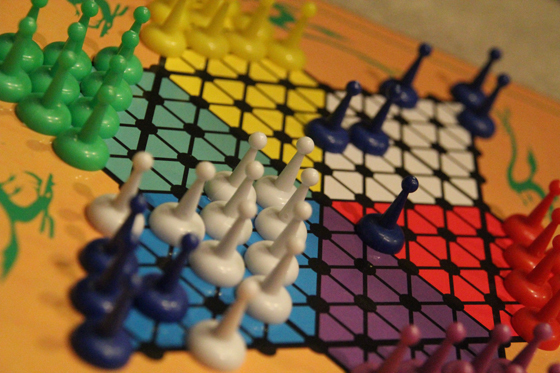 The object of the game is to move all your pieces to the opposite side of the board before the other player can do so. When there are more than two players, you may or may not have an opponent on the opposite side of the board from you, so that changes the strategy a bit. Tonight it was just me and Nick, so we had to maneuver our pieces around each other’s during our game (all the pieces stay on the board – there’s no “eating” of other pieces). Each player can move a piece that’s “open” along the lines of the board (the dots are spaces where your pieces sit at the end of the turn). If your piece has a open space next to it, you can either move to that space, or if there is a piece next to you (but an open space next to it along the line), you can “jump” over that piece to the open space. If you are jumping pieces, you can jump as many times as there are pieces and spaces available (in the shot below, Nick can make three jumps in a zig-zag move!). Since this was the first time we’d ever played, picking up the strategies was fun, but sometimes frustrating. I’m still not sure if trying to keep your men all together (to potentially block jumps from your opponent) or spreading them out (to try to get them toward the other side faster) is better. I tried both ways … and N beat me almost every time (Boo! But he is a pretty awesome chess player, so he’s got the strategic-mindset advantage. Yes, that’s it!). This is an interesting game; it’s pretty quick to learn, but like all good games, it seems like it would take a while to master. N and I played several games to get the hang of it, and I’d like to see how it is with more than two players – I’m thinking it gets pretty crazy with six people’s pieces going everywhere! We had this set from a multi-game box we have, and the pieces slid around over the board a lot when we were playing – I think the peg-style sets are probably better (especially with so many pieces all over the place! ).